Blackberry Torch Review - Learn everything you need to know about the Blackberry Torch before you buy. The Torch received some much needed upgrades from its predecessor, the Blackberry Bold. A faster processor (although not nearly as fast as the rest of the market), a much better internet browsing experience (not as good as the rest of the market either), a touchscreen and keyboard and a more updated look across the entire OS. Bottom line...the Torch just doesn't compete with phones like the iPhone 4G or the HTC EVO 4G. If you are upgrading from a Blackberry Bold, you will be extremely pleased. The form of the phone looks great. The "portrait slider (touchscreen with a physical keyboard)" was a great idea and an answer to a lot of people's problems...functionally. The touchscreen without a physical keyboard, or vice versa, is about the only problem it solved though. 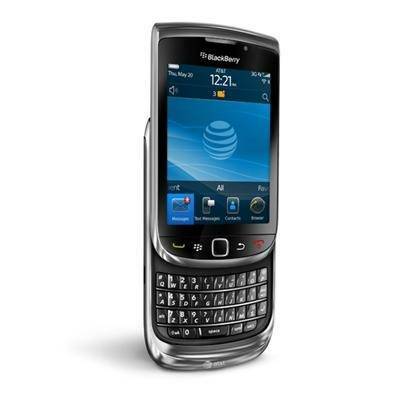 It has the typical "Blackberry" style home keys and on the right side it has a volume rocker and a user-assignable button that defaults to the camera. The power button is hidden discretely on the top as it was on the Bold. The screen is lacking in resolution, 480 x 360, and isn't as big as others at 3.18 inches. So far as music, internet and social networking go, the phone is really not that impressive. They are all easily accessible from the home screen and the apps themselves look just fine, but if you are looking for something to impress you as far as aesthetics go...keep looking. Simple, bare and stripped are the best way to describe them as to not load down the already sluggish processor. The one really redeeming factor of this phone is the battery life. Since it doesn't have to expend a lot of it's battery on cool transitions between apps or pages, the battery life is almost double most smartphones on the market right now. It has one of the highest standby times at 432 hours, but only has an official battery life of 330 minutes. However, if not plugging your phone in every night is important to you, this is a great option to go with. The phone does come with wi-fi synching. However, it still needs a few bugs worked out, and doesn't always work. The universal search button is one of the best features on the phone. Just search for anything on the phone and it pulls a helpful list up of what it thinks you want. It does a pretty darn good job as well. As far as additional features, there's really not much to say. If you are looking for additional features compared to the Blackberry Bold, then you will be pleasantly surprised. "Wow, thanks. This is a first. I've used this company several times before through my lodge or other fund raising venues and never have they offered to set up the pick ups. Thanks much for the help."